I like Ted Allen. He’s been a judge on Iron Chef and hosts a Food Network show. He’s funny, smart and a super nice guy, from what I’ve seen of him. He was a the food and wine guy on Queer Eye for the Straight Guy — a show my wife and I watch when we’re emotionally exhausted from the day. God, those men do amazing things. I asked some folks on Facebook if they had any questions, considering I have tons of useless knowledge of food ways and technique in my head. Here are a few I believe I can answer. How do people eat okra? I just can’t like it. -Totally understandable. The only okra I grew up eating was from my great grandma. She fried it really dark and crispy with a thick cornmeal crust. The slimy texture is the hardest part. I think if you want to try to like okra, cut it into small pieces, batter and fry it. One reason I love okra is how beautiful it is. Not only is it in southern cooking, but is huge in Asian, African and Indian dishes. Okra pickled is delicious. Especially with a salad or in a sandwich. I love using okra in gumbo because it adds thickness. Also, flash frying okra (meaning, cooking it in a pan over HIGH heat for a short amount of time) is good in stir fries and the like. 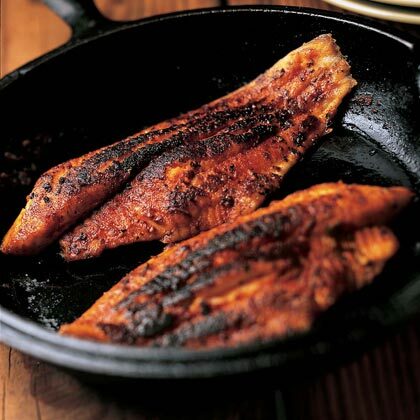 What are some other ways to cook catfish besides frying? THERE IS NO OTHER WAAAAY!!! I’m kidding. Catfish is interesting. A lot folks don’t like it because it tastes too muddy. But, as you can imagine, Southerners are blessed with this fish in abundance. It’s also not a fish that is over-fished, which is important any time you’re talking about catching and eating fish. I will say though, catfish is probably my favorite fish to eat. One of my favorite ways to eat it is just blackened. I think this is pretty common most places. I would coat the catfish filet in sea salt, pepper, cayenne and some thyme. Toss a little canola oil in hot pan, enough to coat the bottom, and cook for about 2-3 minutes on each side. When the fish is almost done, toss in a tablespoon of butter and a squeeze of lemon juice to finish it off. Catfish is forgiving if you over-cook it. In fact, I used to under-cook it a lot for fear of over-doing it. When the meat flakes apart, it’s done. What are some ways to use flax seed? I can go on and on about the goodness of flax seed. It’s such a good source of fiber and well, you can google it to see all it has to offer. As for ways to ingest it? That’s a little more interesting. Mostly, I eat it via smoothie. This is always after grinding it up. Remember to grind your flax seed! Otherwise, you’ll totally see it in your bowels and realize that it doesn’t digest very well unless it’s ground. With that being said, using ground flax in muffins/baked goods is a great use. I think if you can get used to the consistency, eating it in yogurt with fruit is a way I’ve done it before. Flax doesn’t taste bad to me, so you don’t really need to hide it that much. Also, I’ve sprinkled some in granola before I bake it. I can’t say that I cook quinoa a bunch. I should. I know it’s really good for you as a source of fiber and whole grain. Definitely a healthier option as a starch. I like to eat it with tomato, olive oil and lemon juice. I also think cooking it in chicken stock is a good idea. It will add so much more flavor. I’m always open for more questions — especially about southern food. That seems to be what I’m tagged with these days, and I can’t say that I’ll complain about that. It’s the food I enjoy cooking and eating more than anything. Thanks for the questions, to those who asked! This was fun!